There be Tree Dragons in there! 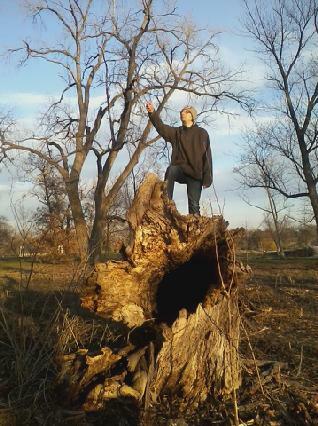 He hath conquered the tree! Forest Park on the first nice day I’ve been able to enjoy. Sometimes I love to wander and make up games and climb things that I’m able to climb. Not pictured: a sand mound that was taller than me = lots of sand in my shoes. This, however, is the secret lair of the Tree Dragon!!!! Which doesn’t breathe fire = probably for the best. Hey, I don’t make the rules, Matt does, as is obvious from his conquering nature captured in a rare moment atop the Tree Dragon Lair. We did not spy the tree dragon, but it lurks it does . . . This is basically my way of saying last Thursday Matt and I thoroughly enjoyed prancing through the park for a couple hours before I went to office max and bought ORANGE pens and white out and I felt it deserved a mention because hanging out with him is pretty much awesome the end. Filed under Fitness, happiness abounds, Personal Musings, ugh! feelings . . .
Today I am awesome – not sure why, but I feel good 🙂 Gettin’ s*** done, SON! and possible a bit of a caffeine/sugar rush from my Large White Chocolate Mocha from Starbucks (not venti, I’m not stuck up.) I’m getting the “excited it’s spring! !” bug and I just want to DO ALL THE THINGS and be the best I can be. I also just fell in love with my friends baby girls all over again, I miss them, but I think I know what my next crafty project will be. 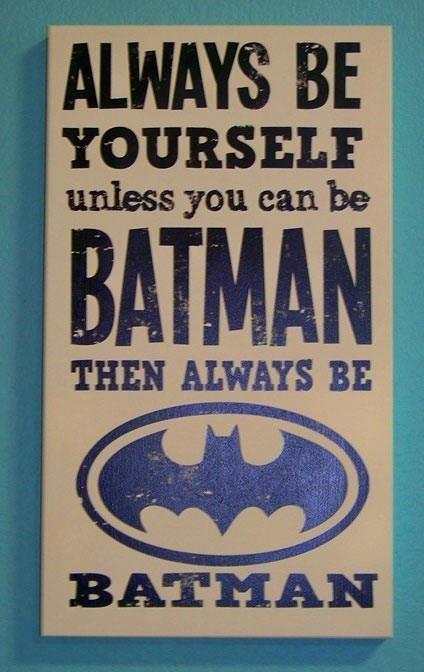 Here is today’s inspiration, though honestly I prefer Superman, but my girlfriend Shannon is a Batman fan so her cute-as-a-button baby WILL have this on her wall, I will make it so! I think about being a parent. I think about it about as much as I plan my wedding in my head. I’m pretty cliched when it comes to that, so I think you will understand that it’s a lot and a half. I worry about the kids I don’t have yet. My biggest worry is that they will be unkind. I also worry that they’ll hate me and make poor choices that punish themselves in hopes to punish me and my spouse. I worry about the grandparents. What they’ll think about my way of doing things to bring up that child. My final worry is their faith. By no means is this a complete list of my worries and fears, but this one is both the last and one of the greatest. I put it at the bottom of the list because I haven’t figured out my own. I am not religious. I don’t believe that Jesus is my savior. Or any of the other profits. I hate to call myself agnostic, but then again, I’m not sure what else I would be categorized as. I’m a person who is okay, good even, with labels, so I’m okay with one not sticking to me right now. I’ll let the faith label slide. So, today, I want to post what my faith feels like right now, and what I hope to teach my unborn children. Faith, from my perspective, is severely influenced. I’ve thought so since I was in the 4th grade. I remember have the conversation with my friend Kendra Lee who went to a non-denominational church. I had attended church with her, as I had with quite a few friends growing up. It was fun and had games and prizes and a movie and a puppet show – far from my experience with my family, both branches of which were Catholic. I asked her during a sleep over, when I was in 4th grade, how she could claim that Jesus was the one and only savior? Her faith was unwavering, which is normal in the heart of a child. I asked her, what if a man in China, who was Buddhist, or whatever (I wasn’t sure) but something other than Christian, was raised Buddhist, married, had a wife and children, which he raised Buddhist. He was a good man, hard working, loving, kind, charitable, and did all he could to be a good person. What if this person was never introduced to Christ? Or, even if he was, does he automatically go to Hell for not knowing, or not believing? Her answer was a resounding YES. And I lost what inkling of faith I had in Jesus Christ. I felt stirrings of faith, usually when I attended COW or Church On Wednesdays with my friends in High School – usually with the songs. For whatever reason, those cheesy Christian rock/pop-esque songs spoke to me, I would feel joy as they praised Him. I would sing along – it’s never been difficult for me to pick up a tune and lyrics – and it felt like praise to something larger than myself. But it would die out once the Youth Pastor began to speak about spreading “The Word.” It has always felt arrogant to me, to preach that yours is the one true way. How the heck do WE know? Isn’t it POSSIBLE that God would present themselves as different things to different cultures? Really, that’s never been something you’ve pondered? Isn’t it POSSIBLE that the humans who relayed this message, who wrote these stories, were trying to steer people to the light, by any means necessary? In the United States, politicians are known to base their decisions on faith. Take, for example, the Representative who based his Pro-Life position on his faith. I respect his faith, but not his decision to impose it on his constituents, because here we have a democracy held up by a republic, and therefore your decisions should be based on creating policies that are beyond your personal faith. But, when the religions were being created, there was no such separation. In many countries there still isn’t. So, to say that my God is right and your God is wrong and to believe in them, or to not believe in mine, means you are punished for all time, I’m sorry, but I can’t stand by that. It also felt arrogant to pretend I had a personal relationship with God. At heart I am a humble, to the point of destructive, person. Why would He do good things for me, just because I asked? This is why, when I prayed, I prayed either for good weather (for my family’s annual trip to Valley Fair (like Six Flags but in MN, so therefore more awesome)) or for my brother. As a big sister I have always worried about my younger brother. School, social life, dealing with parents, it always seemed harder for him. He was sensitive, growing up, and I wanted to protect him. I wanted God to protect him, to show him the way, to be strong when he couldn’t, and to help him stay safe, to open up to the love his family had for him. I felt that if I were praying for someone else, then those might get rewarded. I still feel that it’s selfish to pray for myself. So, if I do pray, you can bet it will be for you rather than me. There are a lot of self-esteem issues wrapped up in that, not being able to hope good things for yourself and all of that, but I still find it to be a noble task. So where does this bring me? I truly believe that had I stayed with and married Steve, I would probably have found my love for Catholicism. Being that I love Matt, I find myself going down a different path. He has made me question, sometimes VERY unwillingly (with much yelling and heartache,) what it would be to have faith in something that’s not a THING. That’s not a higher POWER. In, I guess, a design, or lack there of, of the universe. I don’t know that he’s 100% chaos theory bound, but something to that tune. I, personally, have always believed in a soul. There is something so beyond impulses and equations and happenstance – coincidence cannot be all that there is. But I have started to entertain the theory that maybe our being, or immortal being, is our energy. As if our memory, built by those we know and love and touch and even pass by in the street, becomes manifest after our physical body is gone. And though those people cannot remember us forever, our influence, butterfly effect on the rest of history, keeps that memory going. That combined with the stuff that is US that is not our guts may very well live in a heaven of those before us, watching the lives of others grow and die for eternity. Because energy never actually leaves. All of this, the forays into Christianity, into science, the roots of my liberalism to allow for those around me to live and love and create and do good in their own way, makes me wonder if I will ever have something I can put in front of my children and say, this is the way, this is the path to be a good and wonderful person. Right now, that path is broad, and I truly don’t know if I will ever walk a straight and narrow, or zigzag along it’s breadth. Knowing this will get you through your trials. Believe in that and you will find your mountains climbable. Because knowing you are loved will lead to self love, and love to others. That’s just the nature of it. Filed under happiness abounds, Music, Personal Musings, ugh! feelings . . .
Just TRY being sad listening to this. I have a lot of my pop/dance/funk music on my little ipod 8gig nano and I just shuffled this morning while working on a project and this is what it put together for me. It may be a bit Michael Jackson heavy but who the hell cares, he’s awesome and you are a damned fool if you think otherwise and I don’t think we should be friends anymore. Oh, and, yeah, “Whip My Hair” is on here and I’m not ashamed of that. Though, I won’t be sad if you pass it up. I did embed the spotify playlist but I don’t know if it will play if you don’t have spotify, so I also included ALL THE YOUTUBES. Enjoy your evening/day/whatever time you happen upon my blog – happy listening! **Edit: Spotify was only putting up 7 of the songs which robbed you of the most awesome ones, so eff spotify and just enjoy ALL THE YOUTUBES!! ugh! feelings . . .
Katie has read 7 books toward her goal of 50 books.